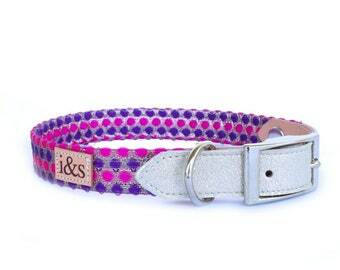 This easy breezy martingale is, in our humble opinion, the BEST style of dog collar on the market. Easy to slip on and off, but won't pull over your pup's head when attached to a leash, they are safe, comfortable, and stylish. There's even the option to add a slide-on ID tag (pictured last) so you can include all of your pup's info without the jingle! Collars are made to order and can be custom sized to fit almost any neck! If you are unsure of what width is best for your pup I'm happy to help and make recommendations. Collar is available in 1.5", 1", 3/4", and 1/2" widths and various lengths - if you want a width/length combo that isn't listed just choose "CUSTOM SIZE" from the options and put your size preference in the notes when you check out. The length option corresponds to the length around your dogs neck - to get an accurate size measure your dog's neck tightly, as close to the skin as possible where you want the collar to fall, then add 2-3 inches, depending on how loose you want to it be. The "length" option corresponds to the size of the collar when it is slack, not pulled tightly. My dog has been wearing this collar for several days now, it is very well made and the print is very cute. This feels way cuter and well made than any other martingale collar that I have used, part of me wishes that it was adjustable, but it fits so well that it's not an issue; I am able to comfortably slip my greyhounds head in and out. Overall no complains, product shipped quickly and is just as cute as pictured.